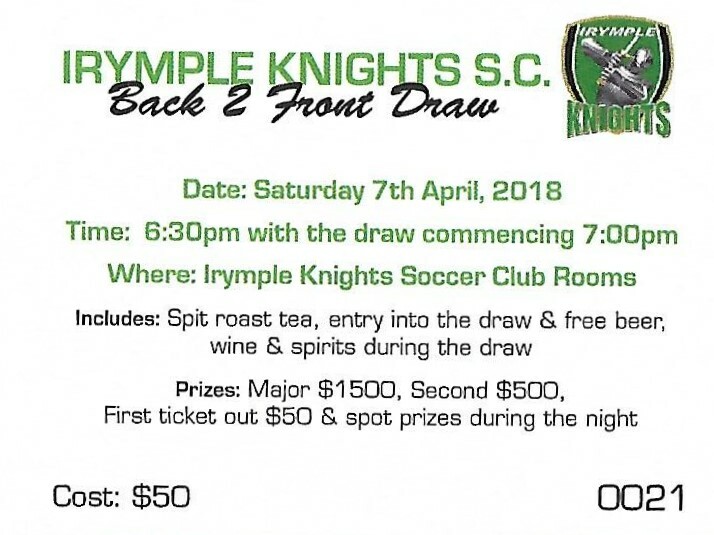 Come down to the Irymple knights soccer club for our annual back to front draw!! It’s reknown for the quality food, cheap drinks and great times. Spot prizes drawn randomly throughout the night. $50 p/head - Includes Our famous Irymple Knights Spit Roast dinner, FREE beer, wine, spirits and soft drink while draw is on. Tickets can be purchased from the club rooms or players and committee members. Can also get in touch with us on the Irymple Knights Facebook page or on this events post. Tickets can also be purchased on the night. Everybody is welcome! Be great to see as many people there as possible and make it another night to remember!